Despite the gloom surrounding the current economic climate combined with the vice like grip that the arctic weather has had on the UK economy the sales of 0845 numbers has continued to rise. 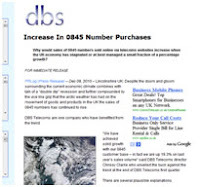 DBS Telecoms inLincolnshire are one company who have benefited from this trend. “We have achieved solid growth with our 0845 customer base – in fact we are up 19.3% on last year’s sales volume” said DBS Telecoms director Chrissy Clarke who unveiled the buck against the trend at the end of DBS Telecoms first quarter.